Textile industries are growing in leaps and bound and together the demand of the automation system too, that ultimately has raised the usage of the conveyor belt in the textile industries, among the yarn processing is one of. 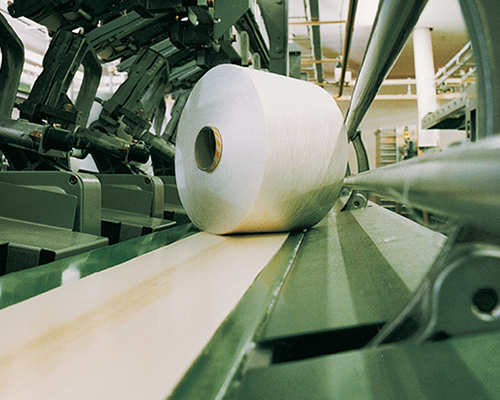 The yarn is the light weight matter, and therefore for us the matter of attention is not weight but a longer service life and cost effectiveness and these both we have imparted in our range of the conveyor belt for yarn by employing the best in class quality PVC/PU material that promises to outlast eternally. This conveyor belt for yarn meets all the industrial quality standards and the pinpoint accuracy towards the engineering makes it completely impeccable range that pledge to perform outstandingly across the years. The selection of the rough top PVC/PU material helps embrace the respective material effectively and thusly prevent the fallback while used for the inclined angle. The material used in the manufacturing of the yarn conveyor belt is anti static and hence prevent the generation of the static charge during the conveying and thusly prevent any hazards. Further, this conveyor belt for yarn is light in weight and hence requires less power consumption for operating and hence slashes down the cost of the overall conveying cost of the yarn, which is the reason for its notable success in the textile industries. This conveyor belt can be availed in the different length and width as per the requirement and also available in the custom made range with the incorporation of the cleats, belts, sidewalls as per the end user necessity.